The photo shows the over 55 hot sauces, condiments and other items I bought at the Fiery Foods Show. As you can see, I’ve got my work cut out for me! Fun times ahead. But first, I’ll have to clean out some old bottles from the fridge before I start opening the new stuff. Check out the bottom shelf! Quite a stock of sauces you’ve got go’n there. I thought my husband was condiment king but you have him beat! Thank you for shopping Inferno World at the 2009 FF&B. We are excited to be included in your photos and fridge. We look forward to visiting with you in the future and sharing some of the new recipes just out of R&D. @Crazy Uncle Jester – Same here, guys, it was a pleasure meeting you. Can’t wait to try the sauces I bought at your booth. Thanks for stopping by! 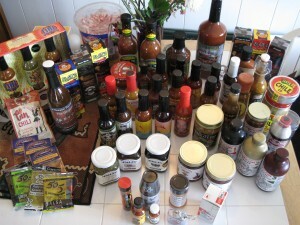 @Michelle -Tell your husband to stop by and say “hi”… always interested in meeting other condiment fans. Would love some fresh “blood” in the world of condiments! Just out of curiosity…do you have a separate fridge you keep food in? We used to have our main fridge filled with condiments that we needed a second fridge for food. 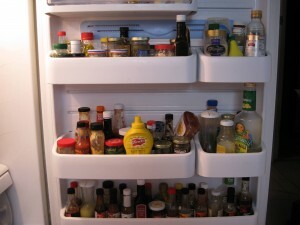 @Tabitha – I wish we had room for a “dorm” fridge just for my sauces and condiments! Wow that is an impressive haul of sauces! I’m going to have to hide your blog from my husband somehow, he’d be so jealous of them all! He (and I) love chilli but he is particularly loyal to Tabasco and a particularly potent sambal oeleck at the moment.